I have great pleasure to inform you about my new partnership with Generali Switzerland. From today, Generali Switzerland is supporting me as official main partner and will be present on my shirt across all of my major Swiss races. The insurance company has been involved in running projects since 2017 with its brand slogan – Whatever moves you. Run for it! – for more physical movement in life. Naturally, I can only support that, and I am delighted to have such a strong new partner supporting me during my journeys of long-distance running. Together with Generali, I will also be involved in a social project named "The Human Safety Net". This is a global movement to support disadvantaged people with the aim of promoting human potential. I came to Switzerland as a refugee and found my new home here, being now a proud runner for Switzerland. This project is therefore a relevant topic for me and I also want to give something back to Switzerland. I very much look forward to getting involved in the refugee and family programme within the framework of this Generali project. 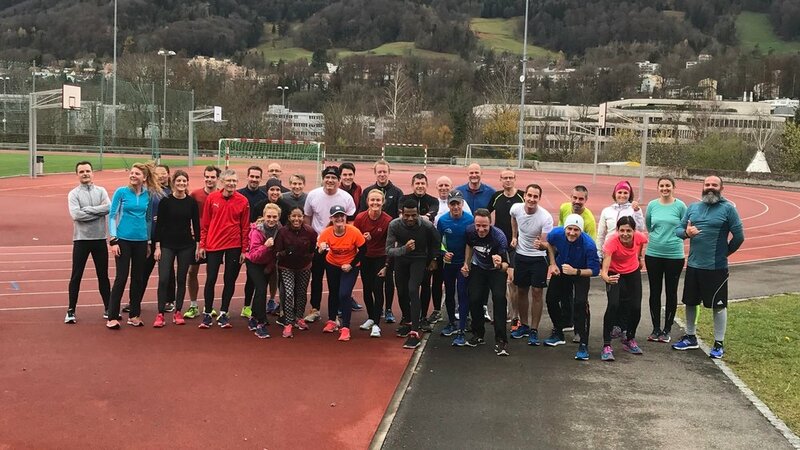 Picture: The first running workshop together with Generali employees, Dec 2018. Ethiopia has been a common topic lately which kept me busy in recent days - in two folds. On the one hand, I’m back in my (high altitude) training camp, after being three months in Europe. On the other hand, I have a new travel partnership with Ethiopian Airlines, who flies me safely and comfortably from Geneva to Addis Ababa and back. I’m very happy about this partnership, since traveling more relaxed means better recovery time - for me as a marathon pro - a crucial part of my success. My Facebook and Instagram Followers were already aware about this collaboration. Some of them may have wondered about my profile picture on Instagram… Tade honours a part-time runner – water instead of a champagne shower… Yes, that's a beautiful story written during the sports camp in Giverola with Ochsner Sports. During this week, there is a race that takes place with runners from all levels on a stretch of 30 kilometre. Viktor Röthlin and I accompanied the group of about 50 people – by the way my wife was also part of the group. So: I went ahead with the faster group, Viktor was in the middle field. But at kilometre 1.5 the leading group was already split up, so that there were just two runners in front – my companion and me. He - 4: 45 / kilometre. Me in a serious longrun - 3:20 / kilometre. Difficult for him, difficult for me - because running slowly can be tough, too. A challenge was needed: my companion should have the best possible Tade support. So, I decided to give him a helping hand before each refreshment stations and organized extra water. One to fight the thirst, two more for cooling down. My running partner was thus well looked after, although his shoes were getting heavier and heavier due to the water and he was also worried about me and moderate pace. So, I calmed him down and told him not to worry about me. Just concentrate on yourself and run. He made the 30km and was extremely happy at the end. After the finish line, I rewarded him with the extra shower - water instead of champagne. He deserved it, as also the profile picture on my Instagram. Tadesse overtaxed all competitors from the beginning with his rhythm. At the finish, he had almost two minutes ahead of Teshome Daba Bulesa after 53:05 minutes. At the GP Bern on the 19th of May I will be wearing my new watch. My Lake Biwa experience is now almost a month ago. My body has recovered. That’s normal. Because instead of a whole marathon, it only run a half marathon in Japan. My head, however, still has a lot to process. My first big event in 2018 and I couldn't bring it to an end - this still hurts. Although in the meantime I finished the Kerzerslauf over 15 km in second place and with a personal best, I’m still disappointed with the DNF. There were many encouraging words from my fans, friends and training partners. Still, I didn’t have the heart to tell our son, that it wasn’t enough. I want to spare him this disappointment. After all, he was so happy when I finally came home after two and a half months of training camp and Lake Biwa. Elod turned seven years old on the 22nd of February. Since I'm usually in training camps in Ethiopia for the first two months of the year, I can’t attend his birthday party. So, he goes ahead and celebrates with his mother and friends. But before my departure in January, Elod said: This year I’m going to wait with my birthday party, till you’re back home. And he did – right after my return home we celebrated. Between a couple of events for my partners Ochsner Sport, CEP and Adidas, I went to see my Doctor in Mollis. The check-up helped me in processing my Lake Biwa experience. Now I know, that my body didn’t recover completely from the both flues I had in December and mid-January. It wasn’t ready for Lake Biwa yet. This means for me: more recovery time. To participate in another marathon before the European Championship, is not an issue. My next big goal is the European Championship in Berlin, which takes place in August. Till then, I’ll be participating on road races. A special highlight this year will be the Grand Prix in Bern, where Kenenisa Bekele is challenging me over the 10 miles. The three-time Olympic champion and five-time world champion over 5000m and 10000m has switched after the 2012 Olympics to the marathon distance. He will first compete in the London Marathon on April 22nd. I have never run against Bekele, I'm very curious. He also trains in Ethiopia, like me. But not in a training group, he trains alone with his pace makers. Finally, a premier on my own account: I’ll be traveling with my wife and son over the Easter holidays. It was a spontaneous decision. These are our first holidays together. I am so happy and my two darlings can hardly believe that it will be just the three of us. As my Facebook subscribers know, life in the training camp in Ethiopia is modest. I wash my clothes in the shower tray, there is no washing machine. And instead of the cushioned lounge chair, I enjoy my book on the wooden chair. But just now, I treated myself to a fine macchiato (and of course a piece of chocolate). This just after a wonderful morning run over 21 km in 1h20min. Well - I don’t have much time left to finish the Harry Quebert. That’s why I have to confess, that I wont be able to fish the book during this training camp, as promised to my wife. After all there are only a few days left for the marathon in Lake Biwa on the 4th of March. I’ll leave on the 27th of February and will arrive in Japan on the 28th. As far as I know, there are only two Europeans invited for the marathon, three from Kenya and one from Ethiopia. He is not a member of my trainings group. The week previous the marathon I reduce my training to 60-70 km. I eat well and enough and recover well. Before the marathon there is always a press conference where the athletes announce at what speed they want to run the track. This is an official announcement and very important for the pacemakers. They should follow these guidelines. If not, they might get less bonus. I wont tell in advance how fast I intend to run. Let yourself be surprised. It would be nice, if it wouldn’t rain on competition day. It is like it is and it comes as it comes. Speaking of age: my young running mate Julien Wanders (soon turning 22) beat a few days ago in Barcelona my Swiss record on half marathon by 33 seconds. That wasn’t entirely unexpected. Julien is a big talent and of course I’ll try to get this record back. Competition is not only exciting for the races, it does make me and Julien stronger. Anyway, I’m looking forward to the next Escalade de Genève. Until then, there are still a few months. And my focus currently is on my race in Lake Biwa. And in Japan, the younger ones should bow to the elders. I got rid of the flu. The endurance test and long-lasting strain have proved it the last days. 15x2 min with short breaks on unsealed road on 2200 meters above sea level. A 37km run in a hilly terrain 2700 meters over the sea level in 2h15min. The last few kilometres we completed in 3 min 25 sec – and in a small group. About three-quarter of my training group went to Dubai for the marathon or to Europe for competitions. In less then two weeks we will be complete again. My first marathon this year – I will run the Lake Biwa marathon in Japan, march 4th. I ran this track once in 2010 and finished third. Good memories. The start will be in the stadium, the track goes along the lake, through the city and back again by the lake to finish in the stadium. The record time on this course is 2:06:13 by Wilson Kipsang in 2011. By the way, there is another object that I always bring along from Switzerland: my red terry towel with the Swiss cross. You can see it on the picture. Well, now I have to come to an end and continue with my book. As a student, I used to read a lot. Since becoming a professional athlete, I have been 100% focused on running. Now I started reading again. Not quite voluntarily. A friend of my wife - both do read a lot - gave me a book for the training camp. “The Truth About the Harry Quebert Affair” by Joel Dicker, a Swiss author from Geneva, in French. I have to admit, it was a bit too difficult for me. That's why she bought me than the English version of it. I’m on page 50 and till the end of the training camp I need to finish the book. And those who know Joel Dicker, know: the book is thick. Ethiopia in the summer - that sounds like shorts and T-shirt weather. That's why my family and friends envied me at my departure from home on January 1st. And that's also what I was looking forward to. Because the “snow match” that we had at the Silvesterlauf in Zurich, showed me once again that I’m not a winter sports athlete. So, off to the sun. But, it wasn’t that warm. In Addis Ababa at 2500 meters above sea level, where I live, Temperatures dropped below 10 degrees during the night, and by day – when I wasn’t exercising – I was always wearing a quilted jacked. After only a few days, I had a cold, was fighting with a cough and finally had to stay in bed. I had to pause one week from training. After that, I was allowed to do what the body wants to do – to run. The first long run test made me happy. 40km at 3200 meters altitude in 2h 30 min. Just accompanied by my training colleague Getu Feleke. It felt good! And made me optimistic, because the first marathon is coming soon. After his injury early this year Tadesse convinced in New York. He could keep up with a high-level field and crossed the finish line after 1'08" as excellent 5th. Tadesse convinces. Right from the beginning he dictated the pace; with an impressive solo run from kilometer 7 on Tadesse won with a good time of 1:03:19,0. He is very happy to have won again in Uster, the home town of LC Uster. I'm glad to inform you, that I will run my first marathon this year in New York November, 5th. I'm happy and I'm looking forward to start in NY! My next competition in Switzerland will be in 2 weeks: Swiss Championship in Half-Marathon at the Greifenseelauf, September, 16th. With a time of 21:43,4 Tadesse wins for the sixth time in a row the Basler Stadtlauf. This makes Tadesse record winner in Basle. 2nd is Bernard Matheka with 1,8 sec behind Tadesse. More details (german/french) Swiss Athletics. Place 7 for Tadesse at the Olympics in Rio. He was part of the leading group til 30km, then the top-favourite Kipshoge increased the speed. Tadesse had to let go and arrived after 2:11.42. That means olympic diploma! He is happy and enjoyed this special time with Christian Kreihenbühl after his arrival. Details (german/french) Swiss Athletics. We are looking forward to august, 21st! At the StraLugano-Run Tade made third in a strong field with global competitors. With 1:01:24 - 42 sec under the Swiss record - he run only once faster. Now he has to recover as the next competition will be this Friday at Schweizermeisterschaften 10’000m. Tadesse wrote swiss marathon-history and is new record holder in Switzerland. In Seoul (KOR) he ran the marathon of his life - with 2:06:40 he set a fantastic Swiss record. He missed the eurepean record only by 4 sec. In Italy Tadesse participated his first international race in 10'000m European Cup. With warm temperatures he finished fourth with a time of 28:41:37. Since 2006 no swiss athlet were so fast - Belz had a time of 28:02:46 and Röthlin 28:23:20. Tadesse won the GP Bern for the second time in a row and for the third time overall. The first time since 1989 as Markus Ryffel won, this year again a Swiss Athlet wins the GP Bern. In contrast to previous year he won by a clear margin of almost one minute. Swiss Athletics and Gallery Athletix. Tadesse was selected for the World Championships in Beijing by the selection committee of Swiss Athletics. This year he will participate in a World Championships for Switzerland for the first time. Besides him the walkers Laura and Marie Polli were selected. For more Details see Website Swiss Athletics (de/fr). On his first marathon in 2015 Tadesse finishes 10th with a time of 2:11:37. Despite a cold days before, he reaches the limit for the WC that will take place in Beijing in august 2015. Tadesse was elected as Swiss Starter February 2015 in the Online voting of Swiss Starters. Tadesse thanks all his fans; this will motivate him for his upcoming race on 15th march in Seoul! Tadesse started with a great race in this new year. He won the half marathon in Barcelona with a fast time of 1:00:42; he improved his personal best and set a new record for Switzerland. Tadesse 2nd at the Silvesterlauf Zürich - 17.8 sec after the fast runner from Kenya Abraham Kipyatich. Overall victory in the Post-Cup 2014 for Tadesse Abraham and Fabienne Schlumpf. Both made 2nd place at this year's 38th Zürich Silvesterlauf and hence were best suisse runners. Tadesse wins for the 4th time in a row the 'Basler Stadtlauf' - Matheka Bernard 2nd and Simon Tesfay 3rd - with a very good time 21:42:6, this means course record! Tadesse wins the half marathon for the 4th time. He won gold with a time of 1:03:13 ahead of Patrick Kiplagat from Kenya. Tadesse wins again! Although not yet recovered after his European Championship Marathon he could ensure a sufficient distance between him an his competitors. With lots of fans along the streets he finished his race with a time of 1:04:33.4. One of the most beautiful victories he sais. After 2011 and 2013 this is the 3rd time he wins the International Greifenseelauf in Uster. Team-Bronze comforts Tadesse about the missed opportunity to win an individual medal in marathon. Tadesse in good shape at test competition 'Foulées de Longemer' in France over 10km. He wins with a time of 29:30. Tadesse is allowed to start for Switzerland! The change of nationality is done. Tadesse will definitely do the marathon for the Swiss Team at the European Championship. The International Association of Athletics Federations (IAAF) informed Swiss Athletics, that Tadesse from now on is allowed to start for Switzerland. Currently he is doing his preparations for this marathon, which is held on Sunday, July, 17 in Zürich. He will then be part of the Swiss Team of six. Tadesse wins his first competition as Swiss. He wins the 10'000m Swiss Championship with a time of 29:05:62 - with record of stadium and Personal Best. Tadesse gets the swiss citizenship! Tadesse Abraham - a Neo-Suisse as favorite at European Championship. On Monday, June, 2, in Sportlounge on TV SRF2. Abraham Tadesse e il sogno europeo: Kurzportrait RSI LA 2 - italian. Winner and PB! See TV-report on SRF 'Sport Aktuell' (German). See also Schweizer Web-TV (German). I'm happy, that the committee of Swiss Athletics selected me for the marathon of European Championship 2014 in Zürich. Zurich Marathon - DNF! Tadesse felt well first. He got muscular problems at km 15 after he wanted to speed up the pace. He then got a cramp in his thigh which hardened noticeable. He had to stop the race at km 32. After a successful training in Aethiopia, I look forward to the Halfmarathon in Lissabon of coming Sunday. At invitation of the organizer of Meia Maratona de Lisboa I will have my first competition this year on Sunday, March, 16 - as preparation for the Zürich Marathon. I am happy to have a new support through my new main sponsor Ochsner Sport and in the area beverage and food through Sponser. Their confidence strenghten my motivation. I am happy about these new cooperations and also about the renewal of the partnership with Adidas. Thank you! Warm temperature und high humidity - satisfied with the result. The third time in a row Tadesse wins the Basler Stadtlauf this saturday; like nobody the last 20 years! Frankfurt Marathon of October, 27, 2013. Although very stormy weather Tadesse started well with the leading group. Unfortunately Tadesse had to give up at KM 30 because of muscle problems. Weeks of training in aethiopia as preparation for the Frankfurt Marathon of October, 27, 2013! Anniversary Company Krebs, Pfäffikon - 125 years. Running arount the Lake of Päffikon with interested people and friends with following signing. New Logo for Tadesse, created by Art Director Denis Schwarz.